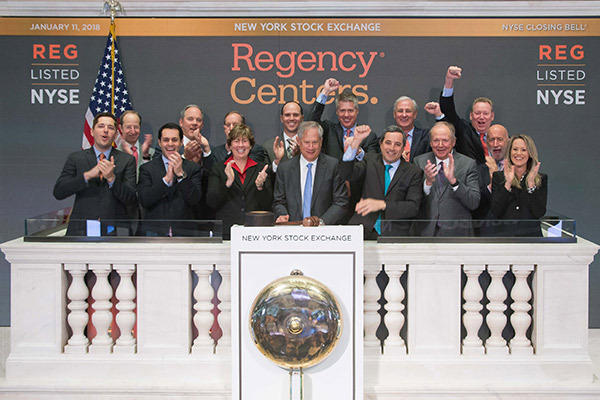 Regency Centers was proud to host Investor Day on January 11 at the New York Stock Exchange. The well-attended event demonstrated 2017's achievements and discussed our unequaled combination of key strategic advantages to drive growth in 2018. Members of our leadership team also took attendees on nearly 20 property tours to demonstrate the strength of our portfolio. The full Investor Day presentation can be viewed on Livestream or in the player below. Please also visit the "Investors" pages of our website. After the presentation, attendees joined our leadership team for the ceremonial ringing of the closing bell on a record breaking day for all of the major indices! Regency Centers is the preeminent national owner, operator, and developer of shopping centers located in affluent and densely populated trade areas. Explore our current properties, developments in progress, or contact us to speak directly with one of our grocery-anchored shopping center development officers or leasing agents today.